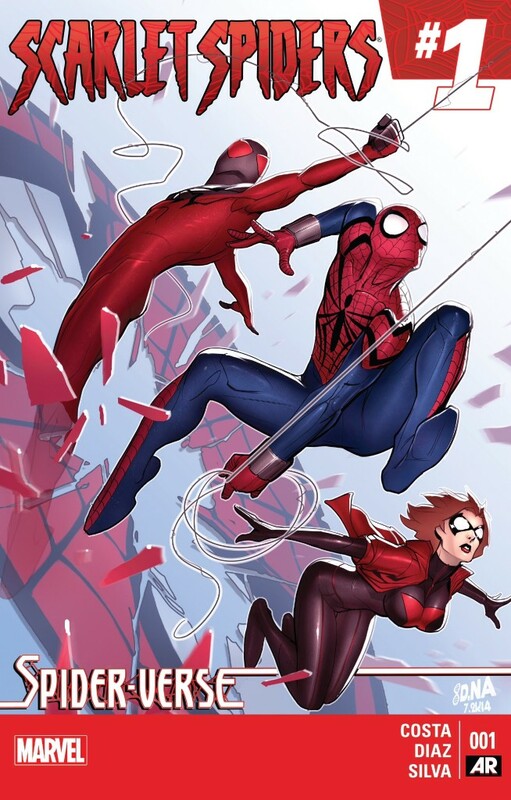 As the world of “Spider-Verse” continues to get bigger with crossovers and miniseries, I do appreciate the approach of some of the recent tie-ins like Spider-Woman, Spider-Man 2099 and the topic of this post, Scarlet Spiders, of providing us with stories that focus on a dedicated cast of characters operating far away from the main action in Amazing Spider-Man. Unfortunately, I don’t think that Scarlet Spiders #1 takes full advantage of this set-up. 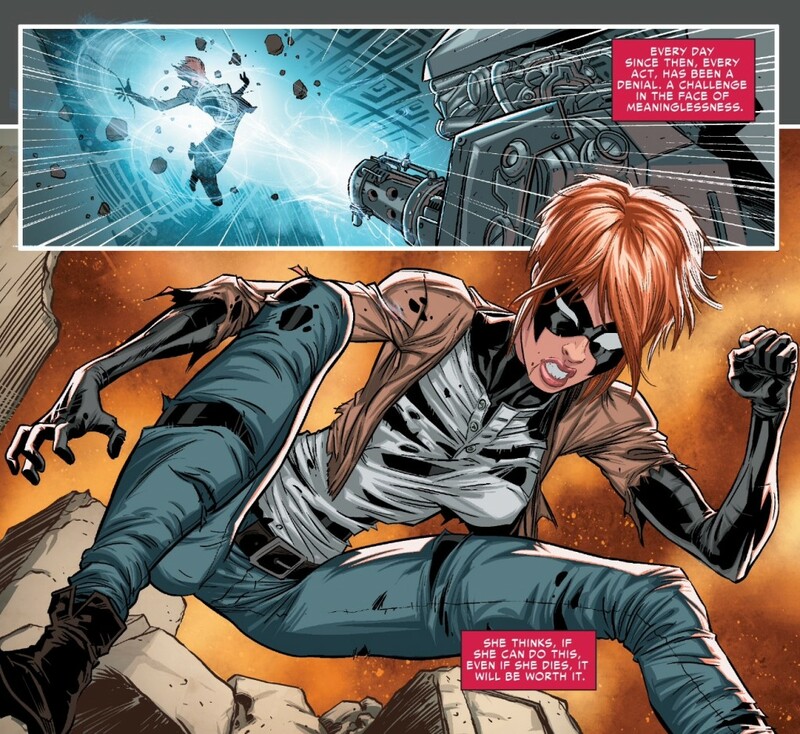 Going back to some of the “Spider Island” miniseries in 2011, books like Cloak and Dagger and Spider-Girl thrived on being able to develop a cast of unique, secondary characters away from Dan Slott’s larger mega-event narrative. As such, these comics felt only loosely connected to “Spider Island” and were able to be judged on their own creative merits in terms of script and artwork. 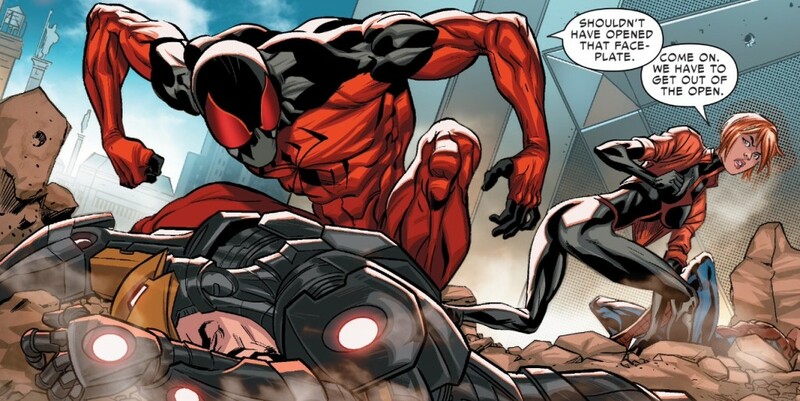 I guess one could argue that some effort was put into making Kaine the harder-edged Spider in the clone crew, but how much of that characterization was actually put forward in this book and how much of it was I really able to cull from my experience reading the Chris Yost Scarlet Spider series in 2012-13? Meanwhile, one would think the return of Spider-Ben, even an alternative world version of him, would warrant more fanfare than what we got in Scarlet Spiders #1. And Drew’s characterization was seriously lacking the loving touch of her creator, Brian Michael Bendis. As a whole, this comic spends more time introducing us to the concept of Spider-clones, rather than actually introducing us to the Spider-clones. But my biggest issue with this comic remains its lack of fun. It’s not that Scarlet Spiders #1 was stodgy by any stretch, but I expected a little more cheekiness and snark from a series that calls back to one of the more controversial eras in Spider-Man comic history. While many of us have clearly moved on from the “Clone Saga” (20 years later), especially in the wake of Scarlet Spider and the resurrection of the Jackal for “Spider Island,” the storyline is still not viewed in a favorable light by critics and long-time fans. 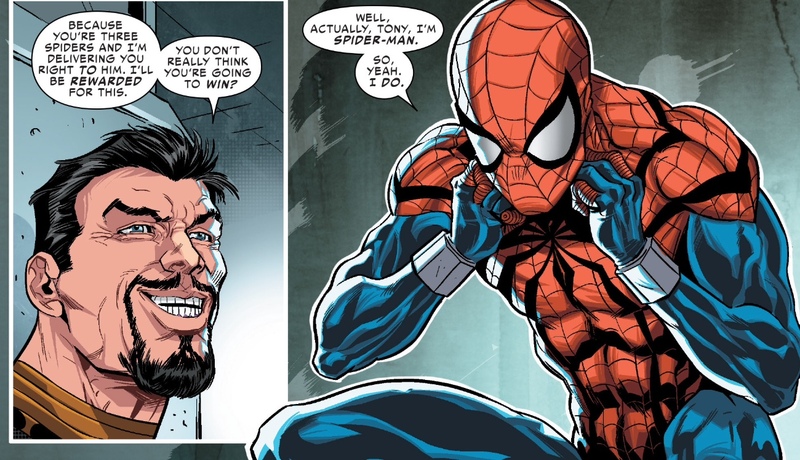 Sure, some (including myself), have softened and agreed that the “Clone Saga’s” awful-ness has been severely overblown, primarily by people like me who were reading it when it first came out and for one reason or another, dropped it before its meandering conclusion. But let’s also not pretend that the “Clone Saga” has suddenly been revised as one of the better arcs in Spider-Man history. Slott plays around with the “Clone Saga’s” reputation when he scripts lines like “it’s a clone thing” in Amazing Spider-Man #10. Those are the kinds of tongue-in-cheek lines I was half-expecting from Scarlet Spiders. But the comic gets caught up in its own minutiae at points. 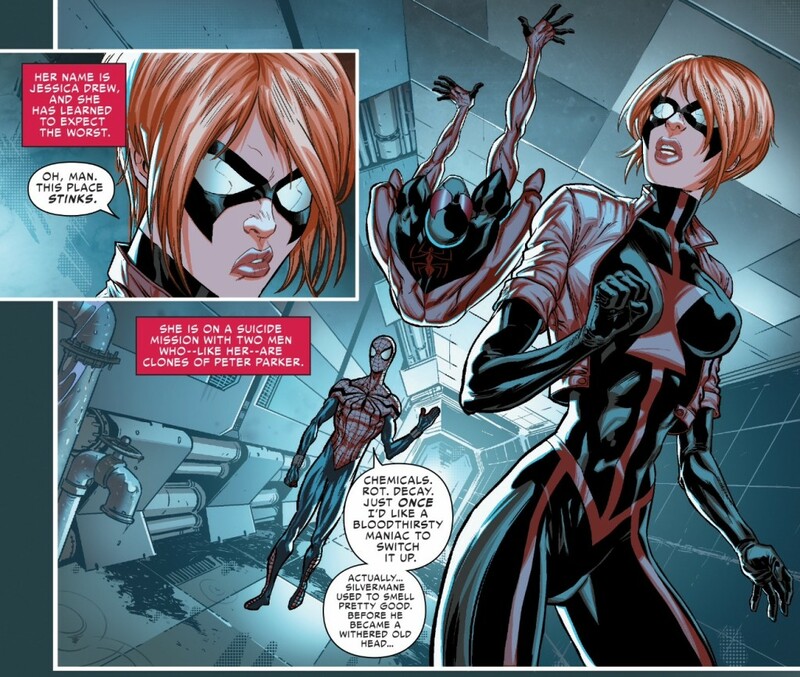 A sequence focusing on the three spiders disguising themselves and then debating with Kaine about the scent of his pheromones drawing the attention of the Inheritors runs on a bit too long and should have been written with more efficiency. And the big reveal at the end involving this parallel world’s version of Johnny Storm feels like it should have landed with more oomph, but instead just comes across like an arbitrary cut-off point. All of this is to say that I actually preferred Scarlet Spiders to the two other minis we’ve received thus far, Spider-Verse Team-Up and Spider-Verse. But I also had higher expectations for this series give its off-beat premise. And once I discovered that the narrative would be structured in a way where this story wasn’t just another random assortment of one-shots and “B” stories, it made me yearn for a more complete story, rather than just the toe-in-the-water approach we got from the creators for a first issue. Yeah, this issue felt really flat. I was so excited to read a new story featuring Ben Reilly, but this tale seemed like it could have been told with any generic characters in the lead.